Capoeira Cordão de Ouro Association (Associação de Capoeira Cordão de Ouro) was founded on September 1, 1967 by Mestre Suassuna and Mestre Brazilia in São Paulo, Brazil. The name “Cordão de Ouro (Golden Belt)” was inspired by a popular song at that time on the radio. It was also the nickname of a legendary capoeirista, Besouro Cordão de Ouro. 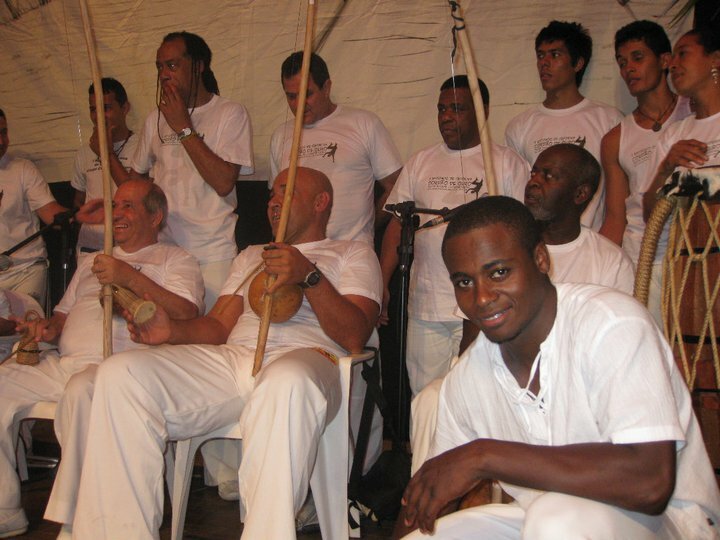 Since then, Cordão de Ouro has spread throughout the world on five different continents, has become one of the most renowned Capoeira groups in the world. Reinaldo Ramos Suassuna, or Mestre Suassuna as he is known, was born in Ilheus, Brazil in 1938. A capoeirista from adolescence, he was initially graduated in Itabuna, with Mestres Sururu, Abine and Tonho Role. Subsequently Mestre Suassuna pursued various lines of Capoeira, studying with Mestres Valdemar, Canjiquinha and Bimba. He went to São Paulo, Brazil in 1965 with a mission to spread Capoeira as a folklore and sport. He was the founder of the first group of Capoeira in São Paulo, Brazil. In the beginning he had many difficulties due to the existing prejudices against Capoeira. The situation got better after it received approval and support from Brazil’s state government. He was contracted to do demonstrations, and subsequently organized the first festival of Capoeira in the state of São Paulo to which he brought famous masters to the place Velha Guarda. From then on, his academy has been very sought after, thousands of students are part of the group, spreading Capoeira throughout Brazil and abroad. * For more information of Mestre Suassuna’s work and group, please visit his website here. Sânzio Corrêa Nascimento, also known as “Mestre Fuinha” started Capoeira with Cordão de Ouro group in Belo Horizonte in 1992. At this time, the academy was called Raízes and the group Cordão de Ouro was supervised by Mestre Ze Paulo. He received the title of “professor” in 2000 alongside Chico, Chicote, Murcego, Cisco, Reinaldo, Custódio and Metralha. Mestre Fuinha received the title of Mestre in 2007. He currently supervises Cordão de Ouro group in Belo Horizonte with Mestra Lú Pimenta and other instructors. He is actively working on a project called “Capoeirança” in partnership with various schools in Belo Horizonte. This project is dedicated to teach Capoeira to children between 2 and 8 years old, and has been very successful. * For more information of Mestre Fuinha’s work and group, please visit his website here. Contra Mestre Neguinho, native to Rio Casca, Minas Gerais, Brazil, has over 20 years experience in capoeira. He studied physical education at Isabella Hendrix Methodist University (Belo Horizonte, MG) and it was his infectious energy and dedication to capoeira that brought him to the United States in 2011 to share and divulge this artform. CM Neguinho has trained with many mestres in Brasil, with dedicated study with Mestres Custodio (Rio Casca CDO) and Mestre Ze Paulo and ultimately with Mestre Fuinha (Belo Horizonte CDO). 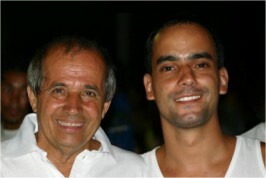 In 2009 Neguinho became Professor and graduated to Contra Mestre by Mestre Suassuna in 2013. He also teaches Afro Brazilian dance, for which he has studied over 10 years. CM Neguinho is additionally available to consult about personal fitness and training. PROJECT BACANA – UPSTATE CAPOEIRA – Project BACANA is the Brazilian Arts & Culture Association of North America – co-founded with Melinda Erickson, aka Professora Risadinha. This dynamic husband and wife team are currently located in the Carolinas teaching primarily in Gastonia, NC, Greenville and Spartanburg, SC, otherwise known as the “Upstate”. We are pleased to share the Brazilian culture and arts with those in the Upstate and beyond and are the only group of its kind in our area. Offering quality instruction and education in capoeira, Brazilian dances and more, including Yoga, AcroYoga and movement fitness. We hope you can join us soon.